The third edition of Indian Polity for Civil Services Examinations, published by Tata McGraw Hill gives the reader a comprehensive insight into the Indian political system. 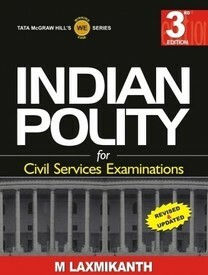 The book covers all aspects that a civil services aspirant would require. The book is divided into three parts. Part I of the book basically deals with India's constitutional framework. It focuses on the history with regard to the making of the Constitution, its features, the fundamental rights and duties as well as amendments made to the constitution. Part II of the book takes an in depth look into the system of government in the country. The chapters in this section highlight the parliamentary and federal system in the country, centre-state relations and the emergency provisions. The special status of Jammu and Kashmir and special provisions made to some other states are also detailed here. Part III, IV and V charts out in detail the various decision making bodies in the three levels of government – Central, State and Local. The remaining sections of the book focus attention on the Union Territories and various constitutional bodies like the Election Commission and the Union Public Service Commission. The updated version of the book includes ten new chapters and four new appendices. Keeping in view the interest of students appearing for the Civil Services examination, the new edition has updated the UPSC preliminary as well as main question papers. The list of tables has also been revised to include the latest figures and the format is extremely readable. M Laxmikanth is a seasoned hand at coaching civil servant aspirants. He did his post graduation in political science from Osmania University in 1989. Later, he set up a coaching academy, Laxmikanth's IAS, which proved to be extremely successful. His experience and expertise in the field of coaching IAS aspirants helped him write the book in a lucid and comprehensive manner.